Dave MeyersNow that “thank u, next” has become one of the year’s buzziest singles, fans are clamoring for Ariana Grande to release her new album, which she’s said will arrive before the end of the year. But Ari says we’ll have to hold on a bit longer, because it’s not quite done. Meanwhile, “thank u, next” is on track to become Ari’s first Billboard Hot 100 #1 hit, thanks to downloads, airplay and record-breaking streams. 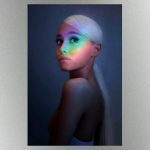 Ariana also got philosophical, musing late Wednesday night on Twitter about how the first single from her Sweetener album jumped the gun just a little bit in assuming that getting over the emotional turmoil of the Manchester bombing meant that her heartache would be over. “remember when i was like hey i have no tears left to cry and the universe was like HAAAAAAAAA b***h u thought,” she wrote. Of course, following that song, Ariana had to then experience the tragic death of her former boyfriend, Mac Miller, after which she broke up with her fiancé, Pete Davidson.